Higher education comes down to a simple concept: investing in the future. As you are considering making this investment, many factors come into play: Campus size, academic programs, student life, professor engagement and much more. But some overlook private university options because of the presumption that it will come with a high sticker price. Higher education at a private university does not automatically mean higher student debt. It is true that the cost of a college education continues to rise — as does transportation, housing, consumer services, and even groceries. According to a 2017 CareerBuilder survey, 74 percent of employers say they plan to hire recent college graduates, and a marketwatch.com survey says nine out of 10 new jobs will go to individuals with a college degree. Many believe obtaining a degree from a private institution is just too expensive and out of reach. But the reality is that with grants, scholarships, and other forms of financial aid, graduates of private institutions are actually entering the workforce with less debt than students who attended a state university. According to a 2018 Kansas Independent Colleges Association (KICA) financial aid survey, KICA institutions distributed approximately $158 million in privately-raised student aid in 2017 and 77 percent of the student aid provided was privately raised. Approximately 99 percent of KICA students received some type of financial aid in the form of grants or scholarships. This assistance has resulted in KICA institution cost coming in 25 percent lower than the national average of nonprofit universities. Finding the right fit in a university is one of the most important steps in obtaining a college degree. An investment in education is not as valuable if the student does not feel they, themselves, were valued. Private institutions are famous for their smaller campus and classroom size. A private university’s average student to teacher ratio can be as low as 11 to 1. Because of the smaller size, private universities offer a unique advantage — professors who truly know and care about their students. For many college-seekers, that one-on-one connection is crucial to a successful collegiate experience. And with that individualized attention, the entire process is more personalized. Everything from the first campus visit to professor mentorship opportunities to walking across the stage on graduation day makes a private university feel more like a home away from home. When thinking about fit, students are going to care about what a university can offer them in different ways and how they can contribute as well. Athletics, academics, campus job opportunities, and more will matter to potential students. Smaller doesn’t mean less when it comes to these areas. Students can expect the same, if not better, experience from a private university with high scholarship opportunities in both athletics and academics. In the end, a good college fit comes down to individual needs. And finding the right fit results in a better future investment. 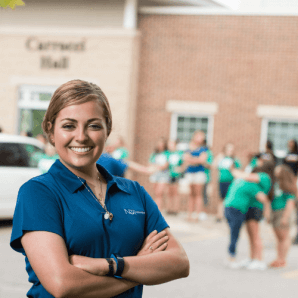 Newman University: The Right Fit? Does this description of a small, private university resonate with you? If so, Newman University may be the fit you seek! Newman University is a small, private Catholic college located in Wichita, Kansas’ largest city. We’re a tight-knit community welcoming students of all faith backgrounds. We offer 70+ academic programs and a personalized experience with a 11:1 student to faculty ratio. Ninety-five percent of our alumni report they are employed or in graduate programs within a year of commencement. More information about Newman University is just a click away. Come see if Newman is right for you! Newman University is a small, private Catholic college located in Wichita, Kansas’ largest city. Founded in 1933, Newman is grounded in Catholic values and traditions, yet is respectful of all faith traditions. At Newman you'll find people, programs, organizations and activities designed to educate your mind and inspire your spirit.